This monastery, up on the highest hill around, is among the most iconic places of the city. Inside the convent is a beautiful courtyard, one of the prettiest cloisters in the whole country. It was founded by Father Alonso de la Cruz, an Augustinian monk. Much of the history of the convent has been lost in the numerous invasions. But there are a few important highlights. See the statue of the martyred Padre Alonso García de Paredes. In the convent chapel, see the revered image of the Virgin of Candelaria, who is also the patroness of the city. And keep your camera ready for the greatest views the city has to offer of the sea and the surrounding lands. By car or take a cab. We hired a driver and toured this facility in the morning. The monastery was beautiful, with lots of history. The flowers in the courtyard were delightful. The church had gold leaf on carved wood from the 1600's. This is a must see if you are visiting Cartagena! You can view the entire city, both the Walled City and downtown Cartagena! Spectacular views! The View is just Amazing. This is a mountain in the middle of the city accesible by car & taxi. I would definitely recommend it. The entrance to the convent is about $5 usd or 12,000 mil pesos Colombianos. Its perfect for pictures they have a parking lot as well and there is always patrol police around the area. Very safe and breezy. Worth it. 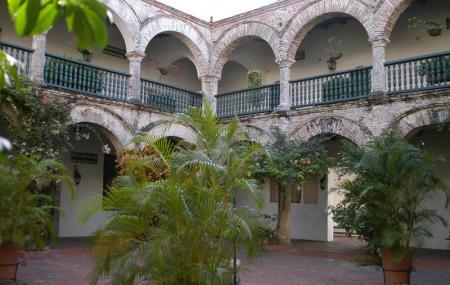 This is very beautiful convent that has the best views of Cartagena. Located in the highest hill of Cartagena, it's a MUST see when visiting Cartagena. Due to its location at the top of Mount Popa, the Convento de la Popa offers the most spectacular view of Cartagena. Reaching the convent by taxi is highly recommended since the neighborhood at proximity is less fortunate. In addition to the cloister and the chapel, you can also visit the convent museum and take a break in the garden before leaving. The entrance is 4,500 COP for adult and 2,500 COP for children. For more picture, feel free to visit my Instagram (IG: kelledstyle). Lovely views, great courtyard full of bougainvillea. Attractive chapel though the gold altarpiece not really our more puritan taste.